Jim Shaw was honored at Mater Dei’s Gala and the band decided to crash his party. Heartfelt condolences to the family of drummer Sean Corridon. Sean will be a greatly missed member of the Patrick Torphy band. Please keep his family in your prayers. Band continues to get ready for parade season, with marching practice added every Saturday, in addition to band practice on Tuesdays. Students are working hard to get ready. Drum lessons continue under the tutelage of Gordon Bell, world ranked instructor and competition judge. He is joined by his wife Bernadette, who is training the Tenor Drums. Per instructors, all will be ready for parade season. This is a great time to take advantage of high level instruction, sponsored by Patrick Torphy Pipe and Drums. Bagpipe lessons are also available to interested parties. 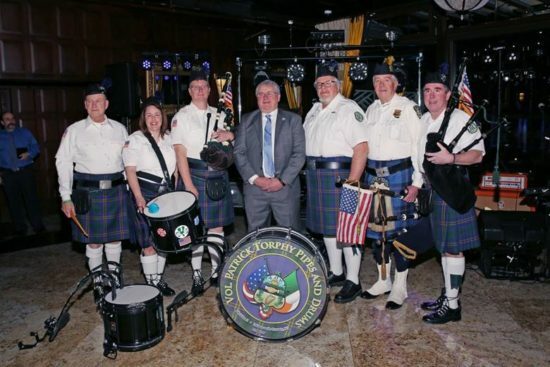 February 4, the band will play at the annual AOH dinner dance to be held at Shore Casino. Planned parades: 3/5 Belmar, 3/11 Hamilton, 3/12 Rumson, 3/15 an event in Carteret, 3/18 Highlands, 3/25 Keyport. Save the date! 4/22 – band fundraiser – baskets needed.